have been killed. Their hit points are revealed after 30 kills. is not difficult. Like all undead, they can be injured by the Holy Bolt spell. Skeleton - These walking piles of bones make up the 'body' of the skeletal regulars. They are armed with twin axes, but are not as handy with them as the corpse axes. They are quick on their feet, but with only 2-4 hit points, they are quick to die too. likely skeleton to pop out of a sarcophagus. milling around. The Carvers - The blue skinned goblin race is probably the tougher one. cutlass and buckler. The second variety has a long spear, taller than its wielder. Carvers are hardy cave creatures, with 6-10 hitpoints. one hit. Once you do kill them, they let out a satisfying screech and wave their legs in the air. before they approach. Their slow movement is also a good invite to ranged weapons. The fearsome ghouls are rumored to be the animated corpses of those buried alive. 5-8 hit points, so they usually take a couple of hits before they collapse. give them 4-8 hitpoints apiece. surrounded, it is easy to die quick (unless you've got good armor and a powerful sword). them before they get close! before they lay down to die. Gargoyles will fly away and resume their stony posture if they are sufficiently injured. until you hit them or get too close--so stay away, and pick them off slowly. which makes them easy to outrun. Use your ranged weapons! wait for them to walk up to you. fresh spitter corpse or in a pile of acid that they have sent (via projectile vomit) in your direction. approach and fight them face-to-face. or chain lightning), then approach for final combat. reason to carry spare rings. items giving resistance to magic)--and that makes a huge difference when fighting them. either by fire or by foot. by Sorcerers. Their attack can be devastating, but luckily must be dealt by hand. Ranged attacks (with a bow) work very well. AC so that other counselors do not interrupt your fire. The boss of level 4. 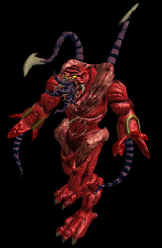 A preying mantis demon, who attacks with slashing arms and a stinger. Will give up the Cathedral Map. A gray, 2-headed unseen that do not disappear. A savage, bull-horned creature, who gores with its facial tusks. Boss of Level 3 of the Festering Nest. A large, knotted monster that horks up hork spawn. It has no immunities, and will give up a magical item. Vicious, head creatures that bite with toothy oversized mouths. A worm-like creature that attacks with an undercutting scissor tail. A floating eyeball with tentacles; fires red stars. A floating eyeball with tentacles; fires charged bolts. A spider that walks on 2 legs, leaving the other 6 free for attack. Also attacks by spitting poison. A scorpion-like creature, who attacks with its stinger. TORCHANT - Festering Nest level ? Part ant, part worm that spits fireballs that explode on impact. A floating skeletal ghost, stronger than the Lich. Fires yellow magic stars, and retreats when approached. A 2-headed brute, who swings a huge battle axe. A metal or stone golem-type creature who crumbles when he dies. A variation of the Devil Kin found in the church crypts. A creature that attacks with fire, retreats when approached. A creature that moves slowly due to wheels on his left leg. He will regenerate hit points if he is allowed to dig. A stronger variation of the Firebat, that attacks with fireballs. A floating skeletal ghost, that fires fireballs. Disappears and retreats when approached. A winged, larger version of the goatboys from the catacombs. A skeletal creature; can be killed by holy bolts. TOMB DEMON - Demon Crypts level ? WINGED DEMON - Demon Crypts level ? A stronger version of the Skullwing; fires magic stars. The boss of level 4. Has no resistances. He will surrender a bow, staff, sword, and book of Apocalypse. Arachnon 50 30-40/none/none ?/?/? 220-260/lightning/? Felltwin 50 25-35/fire, lightning/? 175-205/fire, lightning/? 200-240/fire, lightning/? Flesh Thing 70 150-220/fire, lightning, magic/? 550-700/fire, lightning, magic/? 700-900/fire, lightning, magic/? Hellboar 60 40-50/?/? 220-250/?/? 260-300/fire, lightning/? Hork Spawn 25 15/magic/? 145/magic/? 160/magic/? Lashworm 50 15/?/? 145/?/? 160/fire/? Psychorb 40 10-15/?/? 130-145/?/? 140-160/fire/? Shredded ? ?/fire, lightning/? 205-235/fire, lightning/? 240-280/fire, lightning/? Skullwing ? 35/fire, lightning/? 205/fire, lightning/? 240/fire, lightning/? Stinger ? ?/?/? 145-160/?/? 160-180/lightning/? Tomb Rat ? 40-60/?/? 220-280/?/? 260-300/fire, lightning/? Venomtail ? 20-25/lightning/? 100-120/lightning/? 180-200/lightning/?